I woke up thinking about what I was going to have for dinner. I also was thinking about my mom, grandmother and great grandmother. Three wonderful cooks. When dinner was ready mom or grandmother would yell “dinner” and us kids would drop what we were doing and run as fast as we could. Sometimes we would see who got to the table first. How times have changed. Back in the old days, we had no cell phones, no laptops, there just was no technology, like there is today. Now, our young ones want cell phones, laptops etc. Kids don't play outside like they use to. Back in the day, when kids went outside to play, they actually had to find something to entertain themselves. Today kids sit in front of the TV and play video games, texting, emails, etc. My sister was telling me her 9 year old just asked for a laptop... she was told no. Technology taking over the world. I'm thinking soon they will phase out the home phone (land line). Don't get me wrong, I'm addicted to my cell phone and laptop. But there is a time and place for technology. I see people driving and texting. People standing in line at the store, not even paying attention to the cashier, or anyone around them. I don't talk on my cell phone in line and I never talk on the phone while I'm driving. There is a place for technology. Sometimes you have to put your cell phone down and laptop and pay attention to folks around you. Depending where I'm at I'll put my cell phone on vibrate. Don't forget to smile... little things make a difference. Wash, peel potatoes and cut into quarters. Place potatoes in large pot with water. Cook until fork tender. Drain well. Place potatoes back into pot, add butter, milk, ham, onions and salt and pepper. Mix well. Serve warm. Enjoy! Note: Add a little milk at a time, you can always add more but you cannot take away. These potatoes look tasty! I can see myself having them with spicy chicken too! Well, I don't think we can stop technology ... we can only try to educate on its use and abuse ... but we can still call out, "dinner is ready" ... I do ... your potatoes do look delicious! I would not want to stop technology. I am hooked on my laptop and cellphone. And I love the internet. Yeah, I still call out "dinner is ready". Thanks for stopping by. 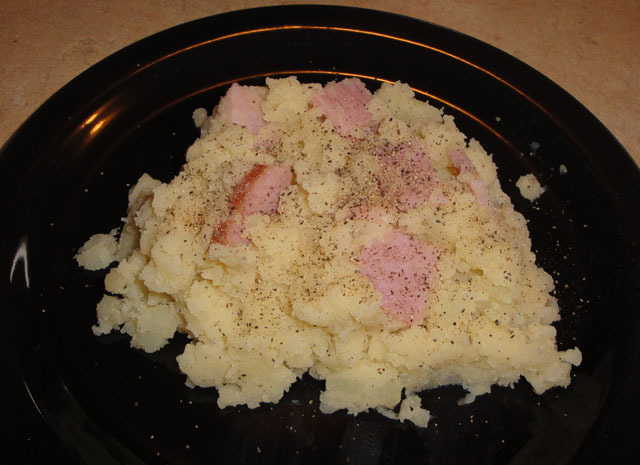 Just give me these yummy potatoes, with the ham steak, and I'm happy! Not a side dish, just an amazing dish that would satisfy, for any meal! Mmmm, this dish sounds so tasty! Hi everyone, thank you for stopping by and leaving a comment. I appreciate it. I love hearing from you! Hi Christine! Thank you for coming to my site. I enjoyed reading your post. I actually like to keep no TV/no cellphone/no laptop at the table and I'm more old fashion that way. I think it's important that family actually enjoy the food and have a conversation. I do have a blog and I use Internet all the time, but we can live without it at least during meal time with family. I love this comfort food Christine. Great post! Hi Nami, it is very important that family enjoy the food and have a conversation at the table. Thanks for stopping by. I look forward to following along with your blog. All the best! ~m. Hi Mary, I'm glad you enjoyed yourself. Looking forward to sharing. Have a good one! Hi Mari, thank you so much. Looking forward to sharing!